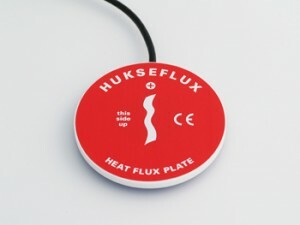 The HFP01 heat flux plate (also called heat flux sensor) offers a solution for measuring heat fluxes. It is especially designed for use inside walls and inside the soil. The HFP01 serves to measure the heat that flows through the object in which it is incorporated or on which it is mounted. The actual sensor is a thermopile. This thermopile measures the differential temperature across the ceramics-plastic composite body of HFP01. Working completely passively, the HFP01 generates a small output voltage proportional to local heat flux. A calibration constant is supplied with each individual instrument. The HFP01 can be used for in-situ measurement of building envelope thermal resistance (R-value) and thermal transmittance (H-value) according to ISO 9869, ASTM C1046 and ASTM 1155 standards. Traceability of calibration is to the "guarded hot plate" of National Physical Laboratory (NPL) of the UK, according to ISO 8302 and ASTM C177. A typical measurement location is equipped with 2 sensors for good spatial averaging. If necessary two sensors can be put in series, creating a single output signal. If measuring in soil, for more accurate measurements, the model HFP01SC should be considered. The HFP01SC self-calibrating heat flux sensor is intended for high accuracy measurement of soil heat flux. The on-line calibration (the Van den Bos-Hoeksema method) automatically corrects for various common errors, in particular those due to the non-perfect matching of the thermal conductivity of sensor and soil, and due to variations of the thermal conductivity of the soil caused by varying moisture content. The HFP01SC is a combination of heat flux sensor and a film heater. The primary purpose is to estimate the heat flux through the surrounding soil. The HFP01SC output is a voltage signal that is proportional heat flux through the sensor. The film heater that is mounted on top can be activated to perform a calibration, resulting in a new calibration factor that compensates for the errors made under the circumstances of that moment. Cable connection, data acquisition and data processing are implicityly tested. Also errors due to temperature dependence and instability of the sensor are eliminated. The result is a much improved accuracy & quality assurance of the measurement (relative to conventional models such as model HFP01). A typical measurement location is equipped with 2 sensors for good spatial averaging. The HFP01SC is typically used for soil heat flux and energy balance studies.